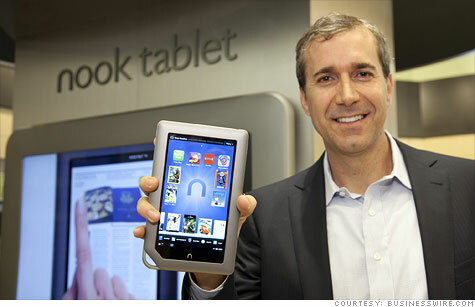 Barnes & Noble CEO William Lynch unveiled the Nook Tablet in November. Now the company may sell off its Nook business. NEW YORK (CNNMoney) -- Barnes & Noble is considering spinning off its Nook business, the company said Thursday in an announcement that sent investors reeling. "We see substantial value in what we've built with our Nook business in only two years," Barnes & Noble CEO William Lynch said in a prepared statement. "We believe it's the right time to investigate our options to unlock that value." That's about the only bright spot for the struggling retailer. In the same announcement Barnes & Noble (BKS, Fortune 500) slashed its fiscal 2012 guidance, sending its shares down about 30% for most of the day. The stock recouped some of its losses in the afternoon and ended 17% lower. The company now expects 2012 losses of at least $1.10 per share, far larger than the 63 cents per share analysts had previously forecast. It expects sales of $7.1 billion, short of analysts' $7.3 billion forecast. Barnes & Noble blamed the larger losses partly on lower-than-expected sales of the Nook Simple Touch, the company's $99 black-and-white e-reader. But sales of its $249 color Nook Tablet, released in November, topped expectations. It plans to increase its investments in its Nook line, ramping up advertising and international expansion -- another factor driving the larger loss. Holiday sales for the Nook unit, including devices and e-books, increased 43% over compared to last year, to $448 million. Sales in B&N's physical stores rose 2.5% during the nine-week holiday stretch, to $1.2 billion. Online sales jumped 43% to $327 million, but the increase was driven by Nook. Physical product sales fell compared to last year. So who might be interested in buying the Nook business? Several pundits cited Liberty Media, the conglomerate that purchased a 16% stake in Barnes & Noble last year. John Tinker, senior media analyst at Maxim Group, suggested that a traditional retailer could benefit from a large digital platform like Nook. "Companies such as Wal-Mart no longer have DVDs as a loss leader to create foot traffic," Tinker wrote in a note to clients Thursday. "[They] are losing on the customer loyalty front to Amazon." Amazon's (AMZN, Fortune 500) behemoth Kindle is the Nook's main rival -- and Amazon famously keeps its e-reader sales under wraps. It has never release unit sales figures. Barnes & Noble also does not disclose its sales of actual Nook devices. But last month, Amazon shed a tiny bit of light on Kindle's performance for the first time, saying: "For the third week in a row, customers are purchasing well over 1 million Kindle devices per week." One tablet to rule them all? Baloney.